Hydration Packs do a body good! This site has been built to provide a reliable resource to help pick a perfect hydration pack or water backpack / bladder system for outdoor enthusiasts. Water backpacks are common in outdoor activities (hiking, kayaking, cycling, running, etc.) and essentially are bags filled with liquid (and packed in a backpack). Staying hydrated is much easier with a hydration pack or bladder because the process is effortless and convenient. Usually, people think of the brand name “Camelbak” in regards to these packs but there are many more options! Buying the right hydration pack to match the needs isn’t always so straightforward, so you will find our first hand reviews will help identify the best hydration packs to match the activity. Easy to use and well made, the Camelbak Men’s Rouge can hold four 16.9 ounce bottles of water easily. I already have several other packs with the hydration facility, but I also needed something that has a slim-line build and this backpack is certainly able to match that need. Plus, the internal and external compartments make it easy to pack a multi-tool, headlamp, cell phone, wallet, snack bars, etc. I am very satisfied and this backpack and it certainly comes in a high-quality and durable material. I don’t have to carry another pack to carry the goods I need when I’m hiking the trails or riding my mountain bike. The simplicity of the CamelBak ThermoBak 3L makes it a perfect hydration system when all you are concerned about is water. There isn’t much in the way of real pockets or webbing to hold extras. But, this is a very high-quality pack which and can last multiple seasons without fail. A great aspect of this CamelBak product is the ease in refill which doesn’t ask me to remove the bladder from the pack. This means the refilling process is convenient and very fast. Plus, it has several D-ring points to make it easy to mount to a suitable vest. I use this particular pack on physically demanding activities and have experienced no real issues. 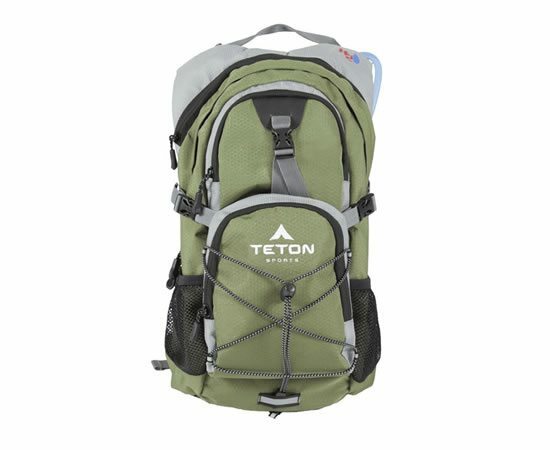 The Teton Sports Oasis 1100 is everything I need for a long hike. I can just about fit everything I need in this pack. The small pockets are great for keys, phone, wallet, compass, binoculars, or similar small items. The bladder section is great for one or two other items. And larger pocket can easily accept a lunch bag, fleece, or rain jacket. I think a slightly larger size would have been nice and would make it easier to pack the most in-demand supplies. A minor complaint I have with this bladder is the initial taste of the water — on the first few trips the water had a quite plastic taste — but after 5-7 trips this is able to clear up. I’ve used the Platypus Hoser on hundreds of miles of trekking and the service provided has been first-class. My opinion of this bladder is high and it is able to easily stand up to some rough treatment. The backpack that holds the Platypus Hoser often gets some good knocks and bumps, but the bladder still remains undamaged. A mouthpiece guard is a great addition to the kit to help keep the bit valve debris free. It is lightweight and has a listed weight at about 4 oz, which is great when you consider it is able to accept 3 liters of water. Also, to avoid issues with stale tasting water I make sure to fully drain the bladder after each and every use. I recently had the opportunity to fully test the Osprey Packs Hydraulics LT and I’m pleased to say it did quite well with no real issues. It has a wide opening which means the process of refilling is easy, even when trekking along the trails. Plus, it comes with indicator markings to let you know the volume of water left or when it is time to top up. No issues with condensation or leaks have been noticed and overall, the construction of the bladder feels good and resilient. Also, this product has a magnetic sternum part which works well and makes sure the hose stays in place. A well-chosen hydration system is the most efficient option for the athlete to sip liquid on-the-go. Be sure to check below for our full review links. Its ridged construction makes it simple to refill. Using a hydration pack is a great way to ensure you always have a beverage with you when you need it, especially when you are hiking and in the outdoors. However, if it isn’t cleaned properly, you will have issues with the tastes of your drinks. So in order to keep your drinks tasting great, you will want to learn how to properly clean a hydration pack bladder. In an ideal situation, you would be able to drain out, clean, and air dry your bladders every time you put beverages in them. However, reality strikes and we end up tossing them in the back seat or trunk instead of cleaning them out properly. Any water left over in your hydration pack will end up being slimy and have bacteria in it that you don’t necessarily want to drink. The best results will be when you clean and dry your bladder each time you use it. However, if you aren’t able to do this or notice that you forgot to there are some tips to help you keep them clean. Empty you pack each time and flush out your hose by holding it above your head and laying the house down and pinch it slightly. Add in some warm water and flush out your hose and pour it out. Scrub the inside of the bladder as much as you can reach by using a sponge and soap. Rinse it out thoroughly. Fill the bladder with warm water and add in a drop of bleach, white vinegar, and baking soda. Shake the bladder and then let it sit for 30 minutes. Dump out your bladder and rinse it out well. Flush your hose them open the reservoir and hang it out to air dry. This will help to make sure the bladder will not stick itself together causing more issues with drying. If it still doesn’t taste right, repeat this process. You may add in lemon juice in your cleaning solution to help with the taste. You will want to make sure to put your bladder in the freezer when you are not using it to prevent any growth of mildew. Plumbers tape is cheap and easy to use! Boom….you’re welcome! Keeping Your Half Pint Hydrated All Day Long! Finding the right Hydration Pack for Kids is the first step to keeping your child fully hydrated during their most rigorous outdoor adventures, and every day activities that require them to maintain the necessary amount of water in their body! Kids these days take part in more extreme style sports, and they can easily lose a lot more body fluid than normal low-key sport activities. This is the very reason there are a number of kids’ hydration backpacks available for them, which can provide a unique water source that keeps them refreshed and completely energized throughout the day. Before the existence of kids’ hydration system packs, your children relied on sources of H2O through portable water bottles, or the local parks water systems. The water bottle is very unreliable, because children can easily lose them, and they can also be unsanitary if other kids are drinking out of the same bottle. The park water system is not always located where the kids are, and on occasion may not be functioning properly. This leaves the kids without necessary replenishment to their bodies, and that can lead to severe dehydration, especially on very hot summer days! Kids’ Hydration Packs Come In Cool Styles, Unique Designs, And Convenient Sizes! Backpacks offering hydration systems are uniquely designed, and depending on which model your children select, they will offer everything from ample storage pockets for accessories, such as mp3 and cell phones, to special attachments, positioned straps, and bungee cords to secure snowboards and/or skateboards. Many kids utilize their packs throughout the day for carrying their school supplies and lunches, and storing their sports uniforms and gear. By the addition of a hydration system to their backpacks, the kids will have a versatile and functional pack with value-added features. The junior style hydration packs for children ages five to ten are lightweight, and can range from 195 – 275 cu. inches in size. The reservoir normally holds approximately 1.5 liters of water, and will provide at least 1 to 2 hours of hydration (for longer periods, consider having a back-up reservoir). CamelBak Kid's 2016 Mini M.U.L.E. Hydration CamelBak	 $50.00	 50 oz. Comfort And Safety Features Come Standard On Many Junior Hydration Systems! Additional features you will find on many junior packs are easy adjustable shoulder and secure Sternum Straps for ergonomic comfort, and safety features like reflective piping while riding on roads in the dark, and attached whistles to help locate the kids in fog, snow, and low light. In order to make sure you prevent any growth of bacteria and mildew you will want to make sure your bladder is cleaned out between uses. This will help to ensure that you not only have a good tasting beverage each time you use it and to ensure that you will not be drinking any bacteria or mildew to cause you to get sick after using the hydration pack. With a few simple steps, you can make sure it’s kept clean and healthy. These are the steps to learning how to clean a hydration pack bladder properly.